The schools in the New Tech Network have committed to the idea that content mastery alone is not enough to prepare our students for the future they will face. Critical skills like critical thinking, collaboration, communication, and personal agency are important for all students to develop so that they can face the challenges of an increasingly complex and rapidly changing world. You can add, edit or delete domain-wide scoring categories for Multi-Outcome Scoring. From the Domain Tool select Domain Setting from the vertical menu. 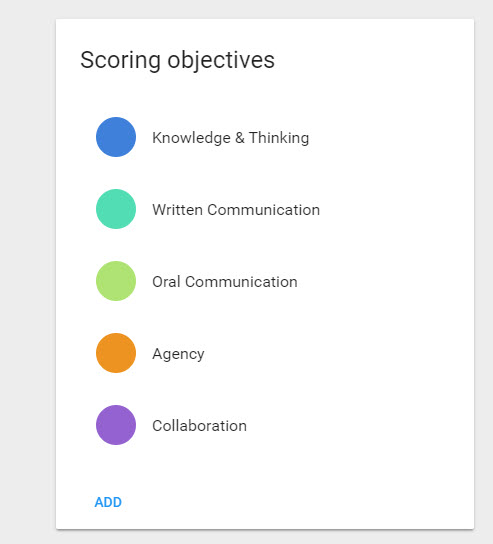 Click Add to add new and/or edit existing Scoring Categories (Objectives). Agreed. We need to adjust the percentages for all courses. How do we do this? This link "How do I set up multi-outcoming scoring in a course" should take care of what you need. If it isn't the answer, please put in a help desk ticket.